Photo shows the colour feeds in to the unit. 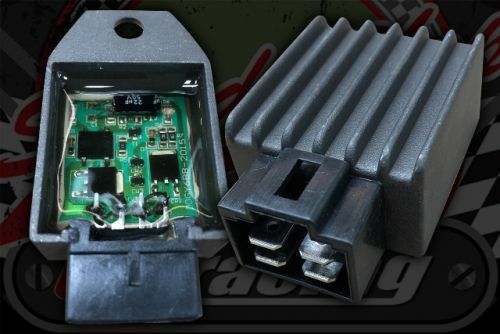 How do you know if you have a single phase charging system, if your main head light comes on when the engine is not running its a single phase Reg/Rec you need part number 8681, if the main lights only work with the engine running you have a split phase system. Also if you have a white and yellow wire coming from your stator; its a good indication of a split phase system. Body colour may vary in colour.